Today we are going to tell you how to remotely access android phone, you can remotely control Android phone by another android phone and also you can access your phone by PC using the apps given below. There are many apps available on the Android market which makes our tasks so easy, with the using of simple and easy applications we can do many things with our android phones. As we all know android is nothing without its amazing applications, applications are the most important part of Android. There are millions of peoples using android around the world and very few of them are aware of some awesome and extraordinary applications of the massive operating system, Utilizing the android applications allows us to use our phone in a more entertaining way. So today we have brought to you some awesome applications, which you can use to remotely access android phone easily. If you are an Android smartphone user and wanted to have a perfect method to remotely control one Android with another. Today you will learn the method that can be done by using some remote android apps that will provide you the remote access of another android phone. We have used our Android smartphones since very long time for performing all daily online tasks. Later, the remote control access is possible on desktop PCs only by some popular remote control software such as TeamViewer and much more. But now you can also get access to another phone by your phone by using some cool apps that we are going to discuss on this post. With this remote control access, if you a geeky friend of your friend’s group then you can now help your friends by access their smartphone by using remote control access apps. You can remotely control your android with another android phone by using app that will provide you remote access of another android and you can have the complete privilege to access all the functions of that android. Open the app on both phones: Follow below process after opening the app on both devices. Once the app opens, you will find two options: “Connect” and “Stream”. The stream is used for the controlling the device, that must be rooted and connect is used for a device being controlled (No Root Required). For the app, to work make sure your devices are connected to the same Wi-Fi network. Also, make sure that the controlling device is rooted. Access the App settings of controlling phone: Tap the menu button, and select “Settings” from the option. Tap on Port for Streaming to check your port. Take a note of that port number because you will need it later for streaming. Link the two devices: Tap the back button of the controlling device and tap on Stream and a notification RemoDroid Server Started will appear. That means your device is ready as a controller. An IP Address of the phone will be displayed at the bottom of the screen. Note that IP address. Tap on Connect in the device you want to control. A Menu will pop up. Here, enter IP address and port of the controller. After that tap on Connect to link the two devices. Start controlling the other android device: Exit the apps on both phones by tapping on Home button. The screen on the controlling device will display the screen of the device being controlled. Swipe across the screen, and use your controlling device as you would normally do. You will see the same functions in the device being controlled. 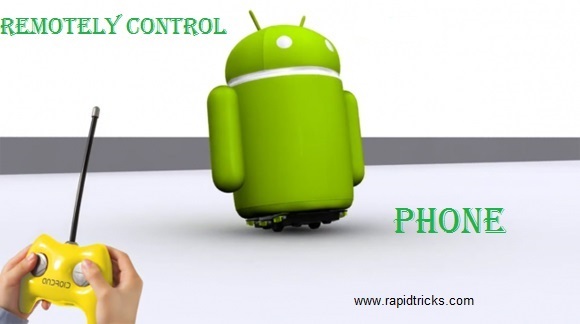 Above I have told you the simple step by step process for controlling the Android phone with another Android phone. You can use many more apps to remotely access android from Another Android and some of the apps are given below. Use the apps given below to access your Android phone using another android phone or PC. Team Viewer is the most popular software for remotely access one computer from another, now the application is available for Android users too, so you can use the application to remotely access Android phone from another phone and also you can use PC to access your android phone. let’s have a look at Instruction video. Screen Share allows users to share music, videos, pictures etc with wireless connectivity, the version is a full release without any annoying advertising. The user can share there phone’s screen and access one phone from another, it is fast and convenient mobile application for sharing data and phone’s screen. Let’s have a look on instruction video. RemoDroid allows users to access any android device using any other Android device, PC or Mac. One mode of the application requires Root, by which you can share phone’s screen with any other android phone by just pressing stream button. Currently the application is in beta state, but you can still use it on any android device and share your experience in the comments section below. Let’s have a look on instruction video. VNC Viewer for Android is the open source application for remotely controlling the android device, it has lots of customizable features and connects to most vnc servers like Real vnc, Inc Tight vnc etc. This application is a little bit difficult to use for those who are not familiar with these type of features although it is a good application for remotely control android phone using another android phone. Join.me is was initially developed for conference meeting on phone, the application allows users to connect at one place from different places. Later the feature of sharing android phone’s screen has developed for the users for a better experience. The application has a lot of features to use and interface of the application looks very user-friendly. So those are the top applications for sharing phone’s screens and remotely access Android phone from another phone, PC or Mac. Share the article with your friends and let them know about these useful applications of Android, share your android phone screen with your friends and enjoy the android in a more entertaining way. So enjoy these applications and Remotely access android phone of your friends. Stay connected with us, and don’t forget to share the article with your friends because “sharing is caring”. If you liked our post then please share it with your friends because now you know how to remotely control one android with another easily by the RemoDroid app. If you have any query then drop those in the comment section below.